A diagram of Taoist cosmology, i.e. the story of how phenomena (the ten-thousand things) emerge from the no-thing-ness of Tao (Wu Chi). 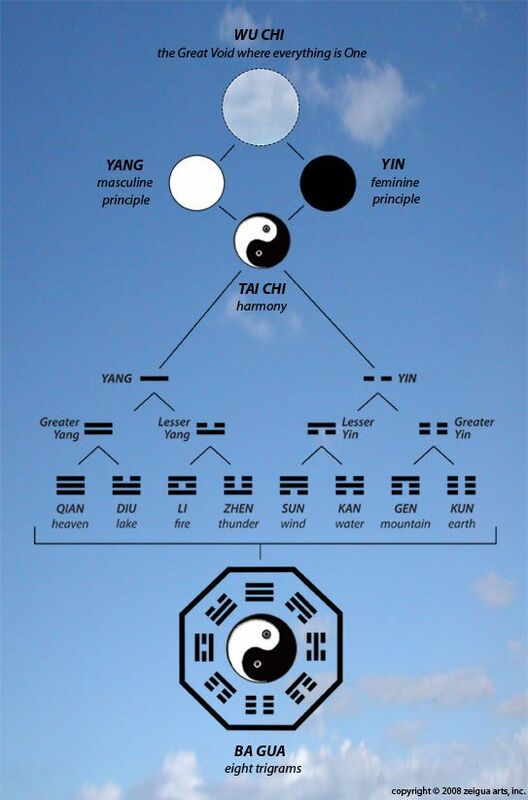 In the Taijitu Shuo version of Taoist cosmology, the Two (Yin Qi & Yang Qi) give birth to the Five Elements, whose various combinations generate the ten-thousand things. In the Bagua's rendering, the Two (Yin & Yang) give birth to Supreme Yin, Lesser Yin, Supreme Yang and Lesser Yang, which then combine to form the eight trigrams, as the basis for the ten-thousand things (i.e. all phenomena of the manifest world). Let’s take a closer look at this commentary, line by line. This is Taoism’s way of expressing the emergence of duality -- of differentiated or discriminated vibratory forms. Elementary Yang Qi and Elementary Yin Qi together represent, if you will, the archetypal dualism. Elementary Yang Qi and Elementary Yin Qi mingle with each other to form Mean Qi. Mean Qi is the state when Elementary Yin Qi and Elementary Yang Qi commune with each other without conflict. Hu Xuezhi’s description here of “Mean Qi” is going to be key to understanding the “Three” of this verse -- and, to my ear, is actually quite profound, pointing as it does to a similar insight to that expressed by the Taiji Symbol. Elementary Yang Qi and Elementary Yin Qi, while representing the archetypal duality inherent in the manifest world, can actually coexist peacefully, rather than fracturing into egoically polarized conflict (with its attendant dynamics born of the habitual conscious/unconscious split). In other words, “Mean Qi” points to dualistic opposition as an aspect of functionality, rather than of egoic identity. Elementary Yang Qi, Elementary Yin Qi and Mean Qi (Three) give birth to all universal things. 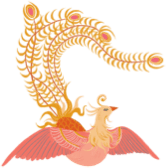 In this cosmological view, then, what gives birth to “all universal things” is the dualism of Elementary Yang Qi and Elementary Yin Qi, relating with each other without conflict. So we have the play of opposites -- necessary for the arising of a manifest world, perceived to be inhabited by more-or-less distinct phenomena -- which remains “friendly” in the sense of transparent to its continuous transformations, and mutual interdependence. Perceptual discrimination functions by designating to a given entity a name, and differentiating that particular named entity from everything that is not-that-entity. But entities function within the manifest world only in relation to other entities -- not only in terms of how they initially are named (as described in the previous sentence) but also in terms of the effects they have upon other named entities -- effects that are possible only by way of their transformation, and so their un-findability as perpetually-fixed entities. For instance: I’m able to change you only to the extent that I also, in the process, am changed. Therefore all things shoulder Yin and embrace Yang. The opposition and the unification bring about the relative dynamic balance. The relative dynamic balance of the appearances of the world depend upon both opposition (i.e. distinction, discrimination, conceptual designation) and unification (a common rooting in Tao). In the language of Buddhism, a similar insight is expressed in the Heart Sutra as: “form is emptiness, emptiness is form, emptiness is no other than form, form is no other than emptiness.” The Tao and the “ten-thousand things” arise in perpetual interdependence. What Is the Meaning of Wuji (Wu Chi) In Taoist Cosmology?